In the past year I have worked on the evaluation of OpenStreetMap data. I was helped by Patrick Weber, Claire Ellul, and especially Naureen Zulfiqar who carried out part of the analysis of motorways. The OSM data was compared against Ordnance Survey Meridian 2 and the 1:10,000 raster as they have enough similarity to justify a comparison. Now, as the fourth birthday of OSM is approaching, it is good time to evaluate what was achieved. The analysis shows that, where OSM was collected by several users and benefited from some quality assurance, the quality of the data is comparable and can be fit for many applications. The positional accuracy is about 6 metres, which is expected for the data collection methods that are used in OSM. The comparison of motorways shows about 80% overlap between OSM and OS – but more research is required. The challenges are the many areas that are not covered – currently, OSM has good coverage for only 25% of the land area of England. In addition, in areas that are covered well, quality assurance procedures should be considered – and I’m sure that the OSM crowd will find great ways to make these procedures fun. OSM also doesn’t covered areas at the bottom of the deprivation scale as well as it covers areas that are wealthier. 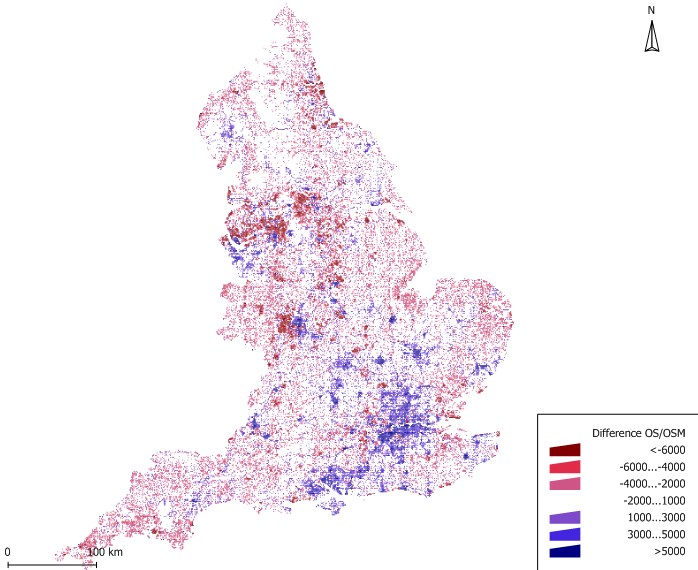 The map below shows the quality of coverage of the two datasets for England, with blue marking areas where OSM coverage is good and red where it is poor. The full report is available here, and if someone is willing to sponsor further analysis – please get in touch! Nice work. Very interesting to see a methodical and repeatable analysis, rather than just qualitative random sampling. How difficult would it be to apply this method of comparison to other countries? This is a really interesting paper. As far as I can tell though the research doesn’t take into account the history of elements in OSM? When you’re looking at the number of users that have worked on an area, you may actually be discounting users who have worked on an area in the past but whose username was then replaced by later edits? I think it’s very important to take this into account as the very peer-reviewing that you are demanding can actually result in the appearance of *less* usernames. Actually, the reason that I’ve analysed the number of users according to the data at the node level is to be able to find information about history of a location. If a person edits an area that was edited in the past, it is highly likely that they will insert some nodes that the first person omitted or positioned wrongly. In this case, you will see the second user appearing in the area on some nodes, but not on all of them. I would note, though, that another way to analyse this is to take into account all the nodes and ways that are included in an area. I’ve tried that for London and the results weren’t that different! I think the availability of aerial imagery is skewing some of the node contribution stats though. The classic example here is TimSC who “owns” a large number of nodes as he’s sat down and traced most of London that wasn’t done already, and probably many other places. For many uses OSM data in these areas would probably be considered incomplete (no road names and often wrong connectivity and/or classification). Although other users are likely to appear in the users per grid metric as they actually map an area, they’ll probably never compete with the original number of nodes contributed. It would be interesting to see if it was possible to remove this effect from the stats to determine what kind of contribution people are making with on-the-ground mapping efforts. I wouldn’t be surprised by similar results, just with different people heading the lists! I think that you are right about the Yahoo! imagery, plus there are quality issues (positional and attribute) that are caused by trusting it without ground truth. Previous Previous post: Are SatNavs dangerous?